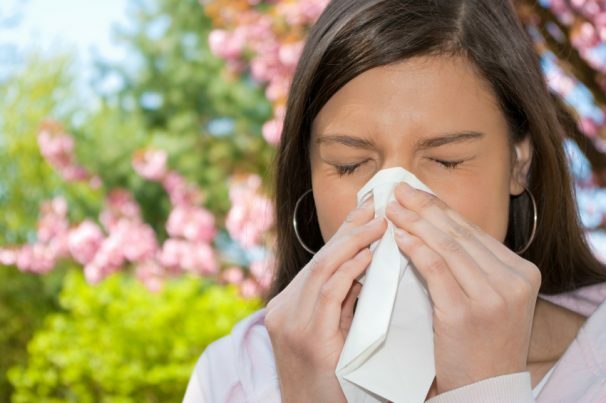 Allergies are any number of bodily reactions brought about by a hypersensitive immune system. These kinds of immune systems will mistake an innocent substance, known as allergens, as harmful, resulting in the production of antibodies to defend the body. The antibody largely responsible for allergic reactions is immunoglobin E (IgE); this antibody binds to allergens then to basophils and mast cells, which then triggers the release of inflammatory, allergic reaction-causing chemicals. Apart from food, plant pollen, medication, animal materials, and even metals can act as allergens. When diagnosing an allergy, a doctor will ask the affected person the frequency of the symptoms, the potential causes behind them, and if any other members of their family have allergies. Following this, a doctor will either refer the affect person to a specialist, or recommend that they undergo tests to determine which allergen is causing their symptoms. These tests include blood tests, wherein the IgE antibody levels will be measured, and skin prick test, wherein the skin will be pricked with trace amounts of possible allergens until the skin becomes itchy and swollen. Anaphylaxis can be fatal if medical treatment is not administered immediately. The most effective treatment for anaphylaxis is epinephrine, which is most often administered through an auto-injector into the thigh muscles. Fatty fish: Salmon, mackerel and the majority of fatty fishes are excellent sources of anti-inflammatory omega-3 fatty acids. In one study, omega-3 fatty acids were linked to the decreased risk of hay fever. Garlic: In addition to supporting the immune system with a good amount of antioxidants, garlic can further help by the body by impeding the production of allergic reaction-causing chemicals. Yogurt: While some people may be allergic to yogurt because of its milk content, it can still benefit others. The probiotics and digestive enzymes found in yogurt can help minimize immune response to allergens, effectively lessening inflammation. Antihistamines: These medicines block the actions of histamines, which are chemicals that lead to allergic reactions. Antihistamines can be taken by adults but are not recommended for young children due to the risk of side effects. Decongestants: Short-term medicines that can clear nasal blockages. Leukotriene modifiers: Medication that works by blocking leukotrienes, chemicals that cause swelling during allergic reactions. In lieu of allergy medications, some people opt to undergo immunotherapy instead. Immunotherapy usually involves administering numerous injections over several months to years, which is meant to help the body get used to allergies. If successful, immunotherapy can prevent allergy symptoms from manifesting once more. Allergies are the result of a hypersensitive immune system reacting to otherwise harmless substances. These substances, called allergens, can range from metals to food to plant pollen to animal materials. Exposure or contact with allergens can cause allergic reactions, which include symptoms like red eyes, skin rashes and nausea. More severe allergic reactions, or anaphylaxis, is marked by hypotension and blue-tinged skin and confusion, and can be fatal if not treated straight away.